I love trees. I love big, massive trees even more. And it’s a bonus if my entire life will amount to less than 2% of it’s lifespan. To stand in the presence of such living things is humbling. And the giant sequoia trees are truly majestic in their immense presence on the western slopes of the Sierra Nevada mountains. The General Sherman Tree. The largest tree on Earth. 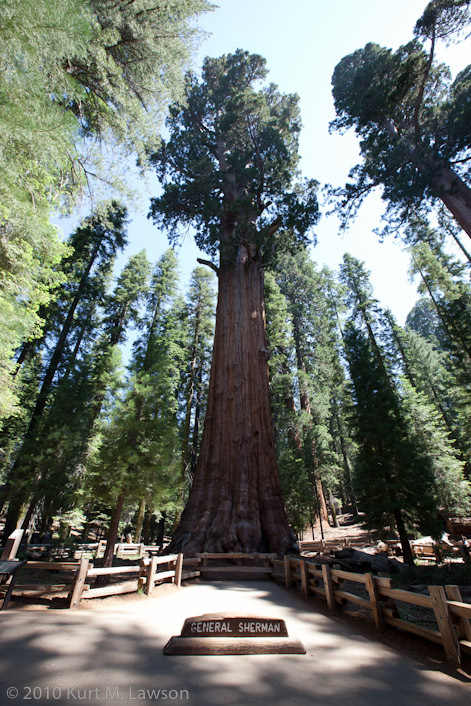 Sequoia National Park is home to the General Sherman tree, which is the single largest tree on Earth measured by the sheer volume of its trunk. I do assert that “General Sherman” is a horrible name for such a tree, given Sherman’s role in the Indian Wars, but I digress. The tree is an awe-inspiring sight. A sign indicates you are proportionally the same standing before this tree as a mouse is standing before a 6 foot tall human. Sequoias are just magnificent trees. 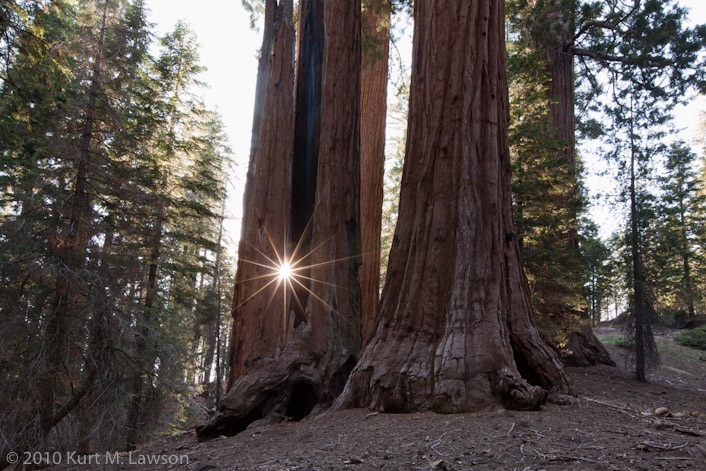 They are truly an American tree, and should have been made our national tree along with other redwoods. Our trip to Sequoia was not all about flora. We did see our share of fauna there as well, including a couple of deer and no less than 6 different black bears. This black bear was right in the middle of the tourist-centric Giant Forest. Just a couple hundred feet from the General Sherman tree. It looked to be somewhat juvenile, and was foraging for insects in various logs while a crowd of people acted as bear paparazzi just 15 feet away. Since it was a nice day, we headed up Moro Rock to check out the view from its granite dome. From Moro Rock we could see Little Baldy, a nearby peak we would summit later that day. The trek up Little Baldy was nice. It’s not a long hike and the scenic rewards are well worth it. It’s nice away from the much more touristy areas like Moro Rock. Looking at Big Baldy from here, I thought that next time I should have climbed to the top of that as well. Big Baldy is a similar hike in length as Little Baldy. I’ll save that for a future trip. 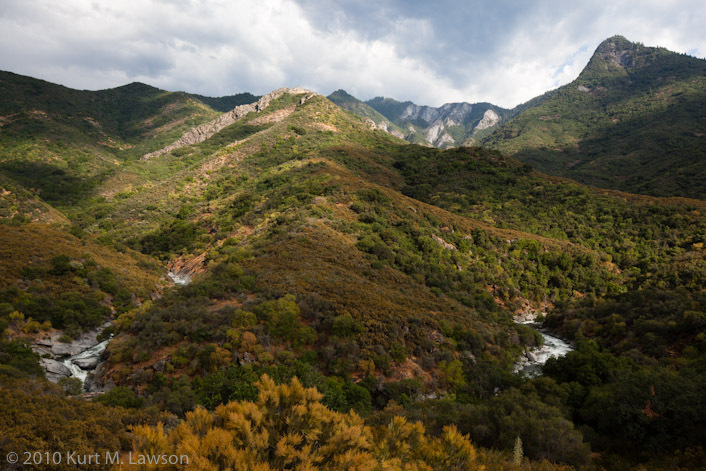 Sequoia is not all trees and mountains. It actually has a large number of caves as well. One of these caves has been partially made accessible to park visitors by guided tour. This allows everyone to get a taste of what it is like to explore such places. It was a nice trip by flashlight. Finally, one last look at the General Sherman tree. This picture was taken with the Canon Tilt/Shift 24mm lens which allows fine control over the focal plane. This is what has made the in focus area in this picture to be shifted. Many of the pictures I took on this trip were with this incredibly sharp lens, though most did not utilize the special talents that this lens offers. I look forward to returning to this magical park. I am once again made to be incredibly grateful that we have the National Park System. Gritty - Beautiful pictures Kurt! Definitely my favorite National Forest that I have been to so far, the trees are just amazing! Last time I was there I went for a trail run and came within 15 feet of a mother bear and her cub. I saw the cub and didn’t realize mom was on the otherside of the trail, thankfully my husband saw mom and got my attention to stop, it was awesome though! !